Pittsburgh-based bank PNC Financial Services (NYSE:PNC) impressed investors on Friday by delivering a quarterly earnings beat. PNC’s second quarter earnings came out before the bell, and the above average results sent PNC stock 1.20% higher in premarket trading. Since market open, however, PNC is down 1.6%. PNC reported EPS of $2.72 on revenue of $4.3 billion, above analysts expectations for earnings of $2.58 per share on revenue of $4.26 billion. The firm was helped by an increase in lending activity as well as new the new tax law, which lowered its effective tax rate to just 18% compared to the 26% it paid last year. Lending activity was the real star of PNC’s earnings: the bank reported that average loans were up 1% from Q1, which was a massive profit-diver for the bank. Commercial lending led the way with the firm’s balances growing $1.5 billion while consumer lending balances rose by $0.1 billion. The bank said that although auto, residential mortgage and credit card loans showed robust growth, many of those gains were offset by lower home equity and education loans. The results showed that PNC has been extremely successful so far in tightening up its operations and working to expand into new cities in order to create new growth opportunities. PNC CEO Bill Demchak remarked that the company is still keeping a keen focus on expanding the firm’s digital offerings, an important move if the bank wants to remain relevant in the coming decade. ATM and mobile deposit transactions made up 54% of the firm’s total deposit transactions during the first two quarter’s of the year, an increase from 52% during the same period last year. That suggests that the company’s efforts to up its mobile game are paying off as more and more customers become comfortable with the firm’s online offerings. The banking sector has been closely watched this year as investors look for signs that banks are finally capitalizing on rate increases which haven’t made a major impact in the industry so far. Since the end of 2015, the Federal Reserve has raised short-term interest rates seven times, the benefits of which appear to have finally kicked in for banks like PNC. Interest income at PNC was up 7% from the previous year and the company’s net interest margin increase 5 basis points to 2.96%, suggesting that PNC’s loans are becoming more and more profitable. From a stability standpoint, PNC’s business also looked strong. Nonperforming assets decreased 7% and net charge offs dropped from $113 million in the first quarter to $109 million this quarter. Over the past year PNC’s stock repurchase program coupled with dividend payments returned $4.1 billion to shareholders and the company’s board authorized a 27% dividend hike that will bring the firm’s quarterly cash dividend up to 95 cents per share beginning in August. Plus, the firm is expecting to conduct another $2.0 billion share repurchase program set to begin in the 3rd quarter. All in all, PNC stock looks pretty solid after the firm’s Q2 results. The company appears to be executing on its strategy to control expenses and find new growth opportunities by expanding geographically. With interest rate increases expected to continue in the coming years and the U.S. economy on solid footing, PNC stock looks poised to continue making gains as the bank gets even stronger. 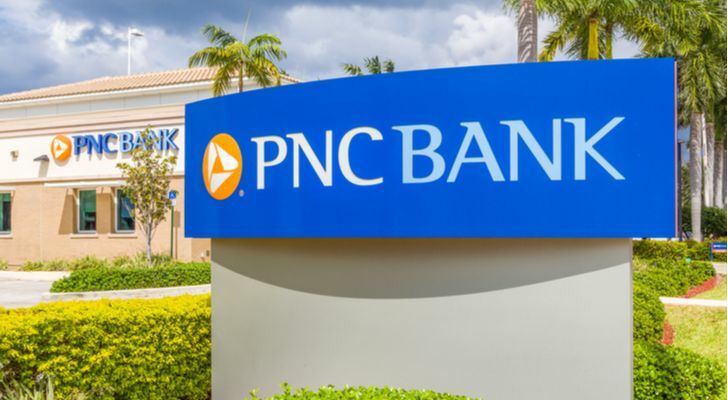 As PNC was the first major bank to report earnings this quarter, analysts will be looking to the results to try to determine whether or not the entire industry will see the same positive results. So far, the financial services sector has delivered lackluster results, so this earnings season will be a good indicator of whether or not the long-awaited pickup will finally occur. PNC’s results bode well for the industry as a whole, but it should also be noted that as a smaller, regional bank the firm has performed exceptionally well amid fierce competition from larger rivals. It looks like the financial services sector is finally getting the injection of optimism it needs, especially if PNC’s earnings are any indication of what’s to come. PNC’s efforts to shore up its business appear to be paying off, and the fact that the firm was able to grow deposits by 2% despite growing competition is impressive. As of this writing Laura Hoy did not hold a position in any of the aforementioned securities. Louis Navellier — the investor the New York Times called an “icon” — just helped investors make 487% in the booming Chinese stock market … 408% in the medical device sector … 150% in Netflix … all in less than 2 years! Now, Louis is urging investors to get in on what may be the opportunity of a lifetime. By using a unique investment strategy called “The Master Key,” you could make hundreds of percent returns over the next few years. Click here to learn about the #1 stock recommendation from one of America’s top investors. Article printed from InvestorPlace Media, https://investorplace.com/2018/07/pnc-earnings-beat-bodes-well-for-the-banking-sector/.